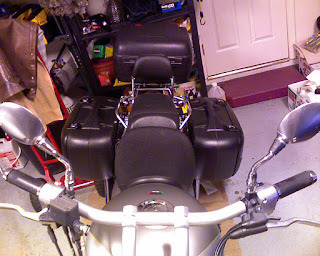 I got a set of Hebco-Becker bags with mounts intended for an EV. I had to make a bracket on each side to correct the mounting points for my Aluminum, but they still worked out rather well. I still need to provide a third mounting point to give the mounts rigidity in the horizontal plane. I plan to pass a strut behind and attached to the license plate bracket and onto the mounting clasp latchplate. That should give the extra side-to-side rigidity required. The bags didn't come with the colored plates which bolt to the outsides of the bag. I just filled the holes with RTV for the present time. No more slipping out between the XS650 and the car now. Next could be a hydraulic clutch??? This turned out to be the instant way to ruin the great handling of the California. The bags catch a LOT of air.